El Anatsui is one of the most exciting contemporary visual artists of our time. Emerging from the vibrant post-independence art movements of 1960s and ’70s West Africa, he has gone on to receive widespread international acclaim for his sculptural experiments with media, form and tradition. In February a major new exhibition of his selected works will open at the October Gallery in London. 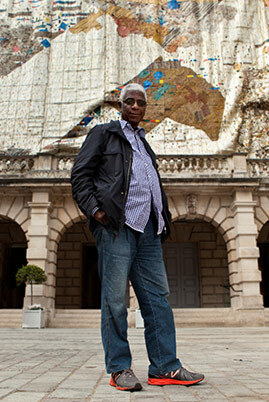 Throughout a distinguished forty-year career as both sculptor and teacher – as Professor of Sculpture and Departmental Head at the University of Nigeria, Nsukka – El Anatsui has addressed a vast range of social, political and historical concerns, and embraced an equally diverse range of media and processes. Making use of tools as diverse as chainsaws, welding torches and power tools as well as developing a range of processes such as the intricate and meditative ‘sewing’ process of his later work, he has shaped found materials that range from cassava graters, railway sleepers, driftwood, iron nails and obituary printing plates, aluminium bottle-tops, etc. to create a wide variety of novel sculptural forms. El Anatsui’s iconic “bottle-top installations” have provoked a frenzy of international attention between 2002 and the present, with institutions queuing to acquire these mesmerising works. Created from many thousands of aluminium bottle-tops wired together with copper, these magnificent wall sculptures continue to excite and amaze audiences wherever they are exhibited. The exhibition will focus on a range of intricate metal sculptures. October Gallery has worked with El Anatsui since 1993, during which time his work has received worldwide recognition. These magnificent sculptures have been collected by major international museums, including the British Museum, London; the Metropolitan Museum of Art and the Museum of Modern Art (MoMA), New York and the Centre Pompidou, Paris, amongst others. Over the last two decades, the works have increased in size, enhancing the external walls of museums and galleries around the world. In 2013, one of his largest metal wall-hangings to utilize his bottle-top technique, TSIATSIA – searching for connection, adorned the façade of Burlington House. Created to coincide with the Royal Academy of Arts Summer Exhibition 2013, this remarkable work went on to win the prestigious Charles Wollaston Award. Founded in 1979, October Gallery, in central London, exhibits innovative, contemporary art from around the world. For over 35 years, October Gallery has pioneered the development of the Transvangarde – the trans-cultural avant-garde.